The present and future of vacuum cleaners will be in your hands when you own the Dyson DC44 Animal Digital Slim MK2 vacuum cleaner. A lot of vacuum cleaners have multiple uses, but there aren’t many vacuum cleaners that can do what this one does. You can have hardwood floors, carpet, rugs, curtains and drapes, stairs and any type of furniture, and you will be able to use the Dyson Animal Digital Slim MK2 for all of them. It is as powerful as a corded vacuum, but it is cordless. In short, this vacuum cleaner is suitable for just about any job that you need to do around your house. 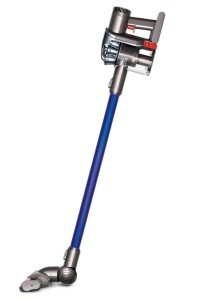 The Dyson digital motor is one of the most innovative pieces of technology in the vacuum cleaner industry. It makes this the most powerful cordless vacuum on the market, and it really isn’t even close. It will never lose its powerful suction, and even has a feature that will allow you to boost the suction if you have some tough dirt or grime to pick up. If you have pets, then you know how hard it can be to clean up after them. Even if you don’t have pets, you will quickly realize how powerful the vacuum is when you clean in your bathrooms or other areas that accumulate dust, dirt and hair over a period of time. With two different types of brushes, you can clean just about any type of surface in and around your home. 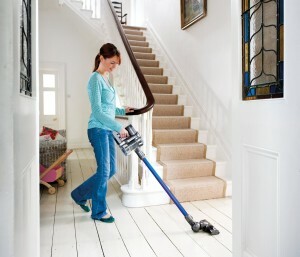 You can quickly transform the vacuum to let you easily clean stairs, curtains or drapes, blinds, furniture or even the interior of your car. There isn’t a whole lot that’s not to like about this vacuum, but there are some things that you need to be aware of. The dirt cup isn’t very big, so if you go a long time without cleaning, or if you have several pets, then you may have to dump the dirt cup a few times when you’re vacuuming. Some people have said that it may actually do too much. It is about as lightweight and compact as it can get for the amount of things that it can do. That actually hurts it, because it is not very big and doesn’t have a wide suction area. This vacuum may not be designed to clean large areas, though, because it is a little small. It’s handy for having around as a versatile vacuum, but don’t throw out your main upright vacuum just yet. Anytime you can find a vacuum cleaner that has a wide variety of options, you have to at least consider it. There’s not much that the Dyson DC44 Animal Digital Slim MK2 can’t do, so it’s hard to argue that it’s not a right fit for your home. If you like to clean frequently and never let a lot of dust and dirt accumulate in your home, then you will thoroughly enjoy this vacuum cleaner. It’s easy to charge and use frequently, so it will make cleaning a breeze no matter how often you like to vacuum.